Today Huawei is unwrapping their latest mainstream device, evolving from the P8 and P9 into the P10. The yearly cadence regularly brings high-level design features from their Mate series into the P-series several months later, and so naturally the P10 gets the latest HiSilicon Kirin 960 SoC with an integrated Cat12/11 modem. As with the last versions, the P8 had the P8 Plus, the P9 had the P9 Plus, the P10 will also be paired with the P10 Plus, featuring near-same internals but with a larger screen and a few extra premium features. To address today’s headline, Huawei is working with Pantone for the material design of the new P-series devices. Under the heading of ‘style’ and matching ‘fashion’, through collaborating with Pantone Huawei is offering the P10 and P10 Plus in Dazzling Blue (similar but slightly different to the Honor 8 design) and ‘Greenery’. It makes for a very striking and green device. Apparently this is the color of the upcoming season, although as Huawei stated at our pre-briefing, much like previous colors they’ve used, they know that they get a polarized reaction to some of the more esoteric color implementations. Aside from the color, the P10/P10P both use the Kirin 960 silicon, which we saw in the Mate 9/Mate 9 Pro. We’ve done a review of the Mate 9, and are putting some finishing touches to a Kirin 960 deep dive with some back and forth with HiSilicon on a few of the numbers. Under the hood Kirin 960 is the first mobile SoC to use ARM Cortex A73 cores, which the SoC combines four of in a big.Little with a set of ARM Cortex A53s. The Kirin 960 is also the first SoC to use ARM’s latest Mali ‘Bifrost’ architecture, under the G71 heading, and the 960 uses an MP8 configuration. This is all with TSMC’s 16FF+ node. Huawei also integrates its own modem, suitable for Cat 12 download and Cat 11 upload speeds. The P10 and P10P will mirror each other on the pure SoC, however the P10P will also support 4x4 MU-MIMO support on the DL link due to a couple of additional antenna in the larger device. The main obvious difference between the P10 and P10P will be the size of the device, the display, and the battery. 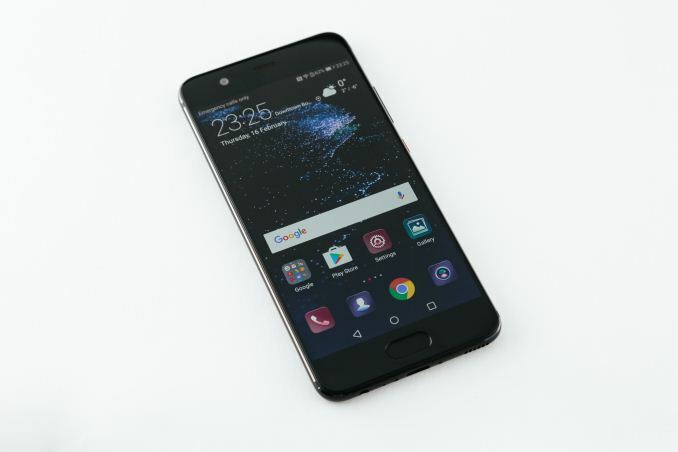 The P10 uses a 5.1-inch 1920x1080 LCD, while the P10P rises up to 5.5-inch and a 2560x1440 and a slight curve to the display, similar to the Mate 9 Pro. Neither device uses OLED, so DayDream compatibility may not be a prominent feature here. 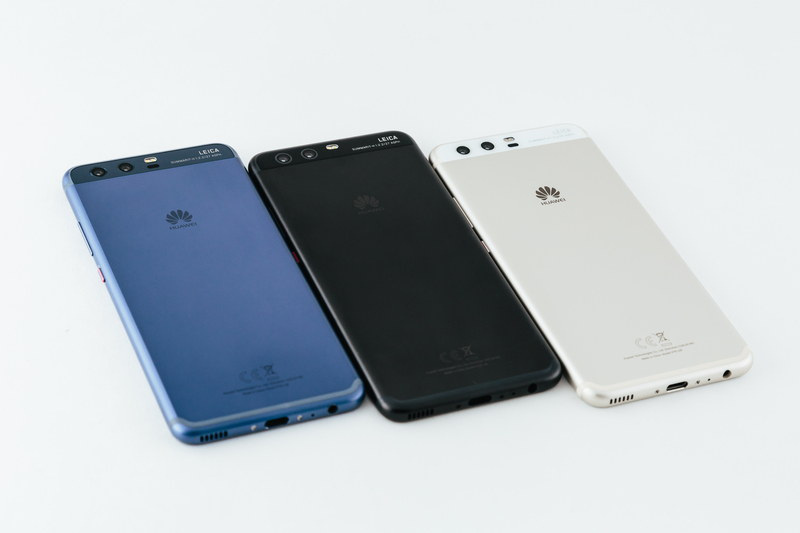 Despite working with Pantone on the color of the chassis for these phones, I did ask about Pantone working on the color accuracy of the displays (a somewhat regular issue on Huawei devices), but there was no collaboration at that level. On the battery, the P10 has a 3200 mAh unit, while the P10P goes up to 3750mAh, and both support Huawei’s new SuperCharge technology that was bought in with the Mate 9. One of the big things to notice with the P10/P10P, compared to any other previous mainstream Huawei device, is that the fingerprint sensor has moved from the rear to the front. Huawei did this with the Mate 9 Pro on a small scale, but it is rolled out across the new P-series products. As a result we get an elongated button for multiple gestures, such as swiping for apps, short press for back, long press for home, and the previous on-screen buttons have disappeared. Personally I would find this change taking some time to get used to. On the Mate 9, the ‘active app’ button on the right also yielded the split screen mode during a long press, but that is now moved to a knuckle swipe function. On the cameras, the P10/P10P has some updates here. 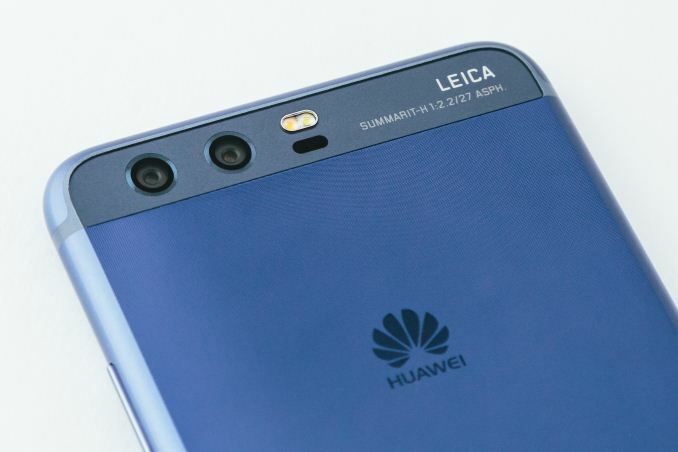 The rear cameras use the second generation of Leica technology, similar to the Mate 9, using a 20MP monochrome sensor and a 12MP RGB sensor, both supporting IOS up to 4K. One change is that the P10/P10P will support a monochrome ‘bokeh’ effect due to dual camera apertures, and similar to the RGB mode it will support adjusting the depth after the picture is taken. On the P10 the cameras support f/2.2, but this is upgraded on the P10P for f/1.8. On the software side for the rear cameras, Huawei has a ‘Portrait’ mode, which comes across like a beauty mode for smoother skin and brighter colors, but this is part of the Leica partnership rather than a few other ‘beauty mode’ variants we’ve seen in the past. Both devices use an 8MP front camera. For capacity variants, both models will offer 4GB DRAM with 64GB variants, however the P10P will also be available in a 6GB/256GB model as well for specific regions only. On colors, Huawei will offer both devices in ‘Greenery’, Dazzling Blue, Rose Gold, Prestige Gold, Ceramic White, Dazzling Gold, Graphite Black and Mystic Silver. Dazzling Blue will be slightly different, with the rear of the case being textured (via diamond cutting and tooling) to give it a mildly oliophobic structure to repel fingerprints and oils. One of the new software features will be Highlights, in collaboration with GoPro. This is similar to various apps that already collage images based on location / GPS data / time frame, however the Highlights gallery also implements GoPro software for users to combine images and video with music and transitions into a 30s or 90s video. We asked if the software does all the video transcoding, and works with different resolution video and transcodes that – the answer was yes, but we were unable to get information on the bitrate. Along with Highlights, the P10/P10P get EMUI 5.1, which implements a new ‘Ultra Memory’ feature which recycles memory when certain whitelisted apps are loaded. This is to remove any additional latency from clearing memory pages later in the apps use. Pricing sits at 649 Euro for the P10 at 4GB/64GB, 699 Euro for the P10 Plus in 4GB/64GB, and 799 Euro for the premium P10 Plus with 8GB/128GB. This latter SKU typically ends up only in select markets, unfortunately, but the other SKUs should be in Huawei's regular market chain. That's crazy pricing for a non-Apple phone.